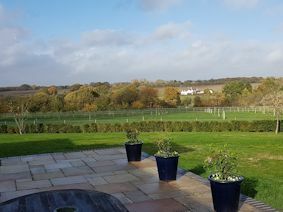 The location for the “Fearless in the Kitchen” www.fearlessinthekitchen.co.uk cooking courses is a cottage kitchen set in beautiful farmland in Berkshire. 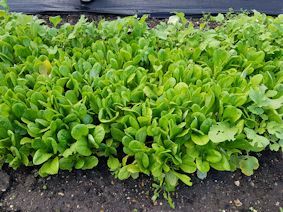 Jen Roach, who runs the cookery courses, is an avid gardener and grows fresh produce in her vegetable garden, which she uses in cooking. 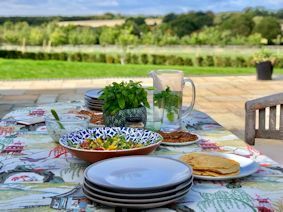 The setting is perfect for learning how to prepare healthy recipes. I’m here for the “Vegan Cooking” course, although Jen offers a range of other courses including “Healthy Baking” and “Healthy Main Meals”. This is a half day course from 10am to 2pm. After several careers including teaching, journalism, marketing and communications for the technology industry, she decided to start a new career teaching cooking and sharing ideas about healthy approaches to eating. “Throughout my corporate career I used cooking as a way to relax. My ethos is to teach people how to eat healthily,” she says. Prior to the course, I was asked to complete a questionnaire about my favourite foods and dietary requirements so Jen knows I am gluten free and my husband is dairy free. She adapts courses to suit people’s dietary needs. You learn so much more besides how to create vegan food. Jen gives invaluable tips, shares unusual ingredients and most importantly, where to get them, as well as snazzy gadgets she’s picked up along the way which really help. My fellow students include Abigail whose son is vegan, Sue, a vegetarian and her husband Dave, who is a meat eater. We are given comprehensive notes about each dish we’re going to prepare. 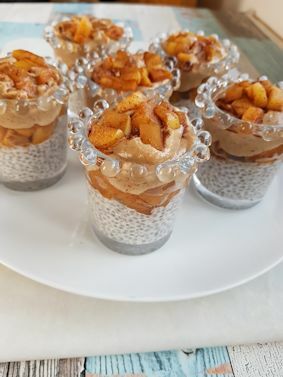 First up are breakfast ideas – Jen has already prepared Apple Cinnamon Caramel Breakfasts – a nutritious meal served in a glass, which include chia seeds, coconut milk, Medjool dates, almond butter and coconut. 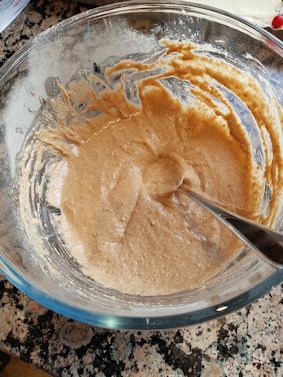 Jen says “I aim to keep sugar as low as possible – dates are good for sweetening.” She suggests soaking the Medjool dates for ten minutes in warm water before putting in a food processor to stop them from sticking. This dish is delicious – the combination of apple, dates and chia seeds works well. She quickly made up the batter and then we watched her make pancakes on the hob. I explained one of the issues with making gluten free pancakes is the batter breaks apart in the pan as it cooks. Jen showed us that the secret is to get the pan very hot so the coconut oil is smoking before putting in a small amount of batter, cook for a few minutes then flip over and cook for a minute. 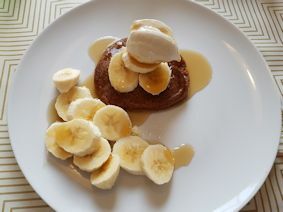 You can add all sorts of toppings, whether you want savoury or sweet pancakes. 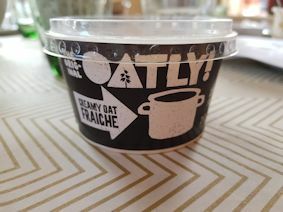 Another major discovery is Oatly dairy free crème fraiche www.oatly.com so a dollop of this was placed on the cooked pancake as well as chopped banana and maple syrup. 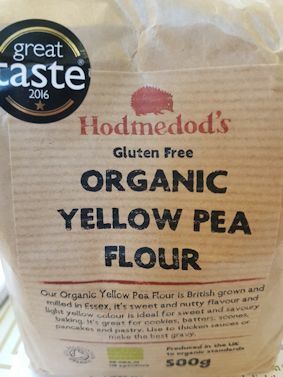 An alternative flour, she said, is the gluten free Yellow Pea Flour from Hodmedod’s www.hodmedods.co.uk which can be used for pancakes, batters as well as thickening sources. Pancakes made with this flour can be converted into tortilla chips by baking in the oven for 30 minutes. 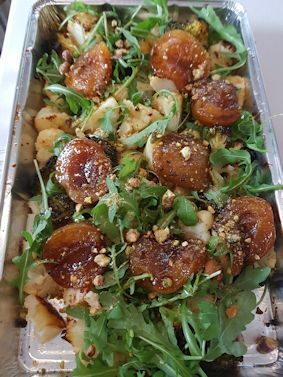 As Jen said “My philosophy is to make vegetables taste fantastic” as she so aptly demonstrated with several recipes such as Saffron Cauliflower with Balsamic Fruit. I would never have thought about roasting cauliflower, but this recipe proves it is a great idea. I also learnt about mincing garlic using a nifty miniature grater Jen had sourced. The cauliflower and broccoli florets were cooked in a mixture of garlic, saffron, lemon zest and chilli flakes. Apricots cooked in a balsamic mixture and quinoa were added to this dish. The burst of flavours is incredible with the contrast of the sweetness from the apricots. Jen’s secret for preparing quinoa is to ensure you rinse it thoroughly for at least two minutes before cooking. Jen also covered how to make a flaxseed “egg” from whisking ground flaxseed with water. The idea is to use this instead of a regular egg. For example, we used it in the Butternut Squash and Red Lentil Kofte recipe as it helps to bind the mixture together. Another tip – you can buy butternut squash already sliced, which saves a lot of preparation time. The butternut squash was mixed with other ingredients such as cooked red lentil and tomato puree to form a mash. 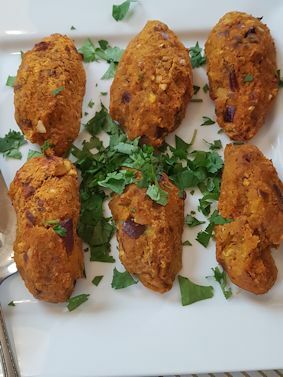 It was great fun making the koftes from this mixture by taking a small handful and squeezing it into the required oblong shape. Jen also demonstrated how to make a scrumptious tomato sauce to accompany this dish. My husband Ray and I have tried to make a dairy free and gluten free cheesecake on many occasions without success. Jen’s Vanilla Lemon & Lime Vegan Cheesecake uses raw almonds, desiccated coconut, dates, gluten free oats and melted coconut oil for the base, while the filling includes ingredients such as unsalted cashews, coconut cream, maple syrup and vanilla essence. Another tip – chill a can of coconut milk overnight and scoop the cream from the top. The result is a heavenly cheesecake with a crunchy base. 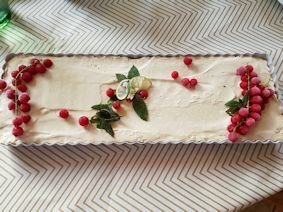 It can be made as a whole cheesecake or individually. The best part is that we were able to take home what we made for dinner that night! This course is well recommended and covered a vast array of different recipes to suit all tastes. I’m looking forward to replicating the recipes at home – especially the vegan cheesecake.